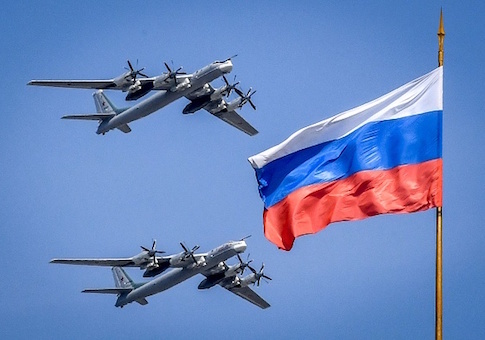 "At approximately 10 a.m. eastern time, two Alaskan-based NORAD F-22 fighters intercepted and visually identified two Russian TU-95 ‘Bear' long-range bomber aircraft flying in the Air Defense Identification Zone off the western coast of Alaska, north of the Aleutian Islands," Miller told the Washington Free Beacon. The bombers were flying in international airspace and "flying according to international norms," he said. "NORAD continues to monitor all air activity emanating from within and outside North American airspace," Miller said. "Putin's Russia is in the nuclear intimidation business and is willing to burn to lot unnecessary bomber fuel, not to mention the cost of refueling and additional maintenance hours resulting from the long flights just to make that point," said Mark Schneider, a former Pentagon strategic weapons expert. "Threatening people with nuclear weapons is Russia's national sport." Alaska is the location of the Pentagon's strategic missile defense interceptor base at Fort Greely, Alaska, about 100 miles southeast of Fairbanks. Much of Russian President Vladimir Putin's anti-U.S. rhetoric has been aimed at U.S. missile defenses that he has asserted are being deployed globally to counter Russian missiles. Bear bombers are equipped with KH-55 air-launched cruise missiles as well as two of Russia's newer and more potent cruise missiles, the conventionally-armed KH-101, and the nuclear-tipped KH-101. "Irrespective of this, my perception is that the bomber ‘combat patrols' as Putin called them when he started them in 2007 are not realistic training for attack but rather nuclear intimidation flights," Schneider said. "When you have nuclear-armed KH-55, KH-102, and nuclear capable KH-101 cruise missiles with ranges from thousands of kilometers to about 5,000-kilometers, it makes no sense to fly the bombers close enough to be intercepted," he said. The reason Russian military forces conducted ADIZ intrusion flights is that if they stayed further away there would be no "intimidation effect" and probably no new coverage of the flights, Schneider said.